Kurosawa’s Rashomon meets TV’s 24 with this highly entertaining yet dubious political thriller, which tells the story of an attempted presidential assassination and bombing at a terror summit meeting in Salamanca, Spain from the points of view of eight strangers who are all privy to different aspects of the event. 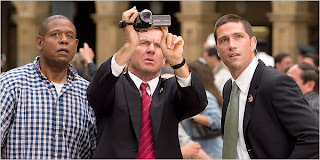 Dennis Quaid is the ideal choice to play Secret Service Agent Thomas Barnes, who after taking a bullet for American President Ashton (William Hurt) has been suffering from post-traumatic stress. Lured back on the job by his younger colleague Kent Taylor (Matthew Fox), Barnes tries to overcome his fears and overwhelming stress that sets him even further on edge after the first bullet is shot. It’s shortly after this first burst of action that the film rewinds itself roughly a half and hour to show the same events from another point of view including one from American tourist Howard Lewis (Forest Whitaker) who is conveniently filming the historic event on his camcorder before we meet several other participants and witnesses. While indeed each rewind brings new light to the events, about halfway into the film we begin losing track of characters when reaching rewind number five; thus instead of a clever and nonlinear experiment in storytelling, it becomes a gimmick and far more ludicrous distraction as events grow even harder to believe. Still, clocking in at just under ninety minutes, director Pete Travis and first time scripter Barry Levy (a former teacher at L.A.’s Temple Israel) keep pulses pounding and once the film careens into a tense action thriller for the last portion of the movie, I began wishing there would have been more scenes of action earlier on, rather than just setting things up until the point when things get interesting and then deciding to rewind. However, much more enjoyable than most critics would have you believe—it’s a slightly above average political thriller, without the intellect required for some of the Tom Clancy styled releases, yet just as riveting as a better evening of TV’s 24, except instead of Kiefer Sutherland’s superhero influenced Jack Bauer or Clancy’s Jack Ryan, we have a cast filled with Oscar nominees and winners including Quaid, Hurt, Whitaker, and Siguorney Weaver.